Athens is the capital and largest city of Greece. As of 2001, Athens had a population of 745,514, and is located within a larger metropolitan area with a population of around 3.8 million. Athens is one of the oldest cities in the world, have been occupied for at least 3,000 years, and is sometimes known as the "cradle of western civilization" or the "birthplace of democracy". The most visible, and famous, sign of this classical heritage is the Parthenon (a temple to the ancient goddess Athena) which stands on the Acropolis (a flat-topped rock which rises 512 feet (150 meters) above sea level). There are of course many other historic sites and monuments, including buildings from Roman, Byzantine and Ottoman periods, as well more modern landmarks constructed since Greece achieved independence in 1830. In more recent years, Athens successfully hosted the 2004 Summer Olympic Games (the Games of the XXVIII Olympiad), having previously hosted the first modern Olympic Games in 1896. True to its name, this travel guide covers all of Athens's major sights and attractions in easy-to-use top 10 lists that help you plan the vacation that's right for you. This newly updated pocket travel guide for Athens will lead you straight to the best attractions this city has to offer, from the Acropolis to the Parthenon. Travel back to ancient times and visit the Temple of Zeus, the ruler of the mythological Greek gods. Expert travel writers have fully revised this edition of DK Eyewitness Travel Guide: Top 10 Athens. • Brand-new itineraries help you plan your trip to Athens. 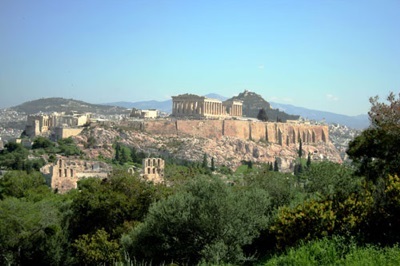 The perfect pocket-size travel companion: DK Eyewitness Travel Guide: Top 10 Athens. Recommended: For an in-depth guidebook to Greece, check out DK Eyewitness Travel Guide: Greece, Athens & the Mainland, which offers a complete overview of this country; thousands of photographs, illustrations, and maps; and more. Lonely Planet’s Pocket Athens is your passport to the most relevant, up-to-date advice on what to see and skip, and what hidden discoveries await you. Marvel at the Acropolis raised spectacularly over Athens, follow in the footsteps of Socrates at the Agora and step into the Temple of Olympian Zeus – all with your trusted travel companion. Get to the heart of Athens and begin your journey now! The Perfect Choice: Lonely Planet’s Pocket Athens is our colourful, easy to use, handy guide that literally fits in your pocket, providing on-the-go assistance for those seeking the best sights and experiences on a short visit or weekend away. Looking for more extensive coverage? Check out Lonely Planet’s Greece guide for a comprehensive look at all the country has to offer. Your in-depth guide to the very best of Greece, Athens, and the Mainland. Make the most of your trip to this beautiful region with our DK Eyewitness Travel Guide. Packed with insider tips to make your trip a success, you'll find a guide to Greece's stunning historic architecture and its scenic drives that let you experience the best hotels, bars, and shops that the city and coast have to offer. Try local delicacies at fantastic restaurants, bars, and clubs, and enjoy the great views in spots that will take your breath away. We have the best hotels for every budget, plus fun activities for the solitary traveler or for families and children visiting Greece. With hundreds of full-color photographs, hand-drawn illustrations, and custom maps that illuminate every page, DK Eyewitness Travel Guide: Greece, Athens & the Mainland truly shows you this destination as no one else can. Written by locals, Fodor’s Essential Greek Islands is the perfect guidebook for those looking for insider tips to make the most out their visit to Greece. Complete with detailed maps and concise descriptions, this Greek Islands travel guide will help you plan your trip with ease. Join Fodor’s in exploring one of the most exciting destinations in Europe. The Greek Islands represent the ultimate Mediterranean getaway. Impossibly blue seas, gorgeous beaches, whitewashed alleyways draped in pink bougainvillea, blue-domed Greek Orthodox churches, picturesque villages, and famous historical sites have lured visitors to these wonders of the Aegean for hundreds of years. Bursting with beautiful full-color photos, Fodor's Essential Greek Islands provides expert insider advice on everything from the best beaches in Crete to the best archaeological sites on Corfu. Also included is full coverage of the big-city wonders of Athens, the primary gateway for travelers to Greece. •UPDATED COVERAGE: Fodor's writers have scoured the islands to find the best new hotels, resorts, restaurants, shops, and sights. •ULTIMATE EXPERIENCES GUIDE: A visually stunning color photo guide covers the essential sights and unmissable attractions throughout the Greek Islands. •DETAILED MAPS: Full-size maps throughout will help you plan efficiently and get around confidently. •GORGEOUS PHOTOS AND SPECIAL ILLUSTRATED FEATURES: Full-color features on such topics as The Acropolis, specialty crafts made in Greece, Greek cuisine, Greek gods and heroes, Greek history, and Greece's long wine-making tradition illuminate the most distinctive aspects of the Greek Islands. •INDISPENSABLE TRIP PLANNING TOOLS: Includes a "Need to Know" feature with top-line planning information about the country as a whole, "Top Attractions," and other useful travel tips. Helpful features on what's new in the Greek Islands, how to pick the perfect beach, and when to go, all make a trip to the islands as simple as possible. •DISCERNING RECOMMENDATIONS: Fodor's Greek Islands offers savvy advice and recommendations from local writers to help travelers make the most of their time. Fodor's Choice designates our best picks, from hotels to nightlife. •COVERS: Corfu, Crete, Rhodes, Hydra, Lesvos, Mykonos, Santorini, Naxos, Paros, Athens, and much more. Planning on visiting the rest of Greece? Check out Fodor’s Essential Greece. The recent economic crisis in Greece has, paradoxically enough, created better conditions for tourism. The Greeks are painfully aware that tourism is their best-functioning remaining industry. They value the visitor as never before, treat them with a warmth and courtesy that exceeds what you’ll find in other parts of Europe. And more people are therefore coming here in unprecedented numbers. To bring the current message of Greek tourism to a reading public, we've called upon the research and writing talents of one of America's foremost travel journalists. Stephen Brewer has been writing travel guides for almost three decades. As an editor and writer, he has focused not just on the Frommer guides but on European coverage for such magazines as Esquire, Connoisseur and Geo. In Frommer's Athens and the Greek Islands, he brings tremendous insight into how to best approach and understand both the famed and lesser-known (but still fascinating) historic sights of Athens and the adjoining Peloponnese, as well as the recreational resorts and life of the enchanting Greek islands. Lonely Planet Pocket Athens is your passport to the most relevant, up-to-date advice on what to see and skip, and what hidden discoveries await you. Marvel at the Acropolis raised spectacularly over Athens, follow in the footsteps of Socrates at the Agora, or step into the Temple of Olympian Zeus; all with your trusted travel companion. Get to the heart of the best of Athens and begin your journey now! The Perfect Choice: Lonely Planet Pocket Athens a colorful, easy-to-use, and handy guide that literally fits in your pocket, provides on-the-go assistance for those seeking only the can't-miss experiences to maximize a quick trip experience. Looking for more extensive coverage? Check out our Lonely Planet Greece guide for a comprehensive look at all the country has to offer, or Lonely Planet Discover Greece, a photo-rich guide to the country's most popular attractions. Get to know the most atmospheric open-air cinemas and drawn up walks around Athen's neighborhoods – one a leafy suburb, another by the sea.